On moving into a new home, one of the first things most people tend to do is to start decorating and refurbishing in order to put their own mark on their new house, making it feel a little bit more like home. One of the main things that it takes time to get used to in a new home is the size of the rooms. This is particularly true if you have moved to a property which has smaller rooms than you are used to. Thankfully, there are lots of clever design tricks that can be done to make rooms seem more spacious. One which I want to look at in more detail here is the use of mirrored doors. How Can Mirrored Doors Make A Difference? Something which goes hand in hand with space is storage. It is a necessary feature of the home, but can take up quite a bit of valuable space. One very good example of this is wardrobe or closet space in a bedroom. If the bedroom is on the small side, adding a wardrobe to an already crowded space can have the effect of drawing the walls in on themselves making the room appear even smaller and darker than it already is! A common way to address this problem is to incorporated mirrored doors on your wardrobe. This will create the illusion of more space in the room, thus eliminating any claustrophobic feel to the room. Mirrored doors are available from a variety of different suppliers including Hammonds Space where you will find many different styles and sizes on offer. Not only will this create the illusion of space , but having your mirror and wardrobe doors combined means not having to use up more space for either a wall mounted or free standing mirror. That is an extra little space saving bonus! There are some other benefits which come with choosing mirrored doors apart from the space saving aspect. One of my favorites is the safety benefit. When you hang a mirror on the wall, a breeze or even a slammed door can cause the mirror to move and it may fall from the wall and smash. Similarly, a free standing mirror can be knocked over and also presents a tripping hazard. However, with mirrors that are fixed securely to the wardrobe doors these issues are eliminated making it much safer. Another benefit is that you get a full length mirror which allows you to get a complete view of your outfit. Even floor standing mirrors marketed as 'full length' often have to be angled just right in order to get a head to toe view, and the result is often slightly distorted thanks to the strange angle. Finally, the aesthetic appeal of mirrored wardrobe doors is also an attractive benefit. Mirrored doors look sleek and modern and are a stunning addition to any room! 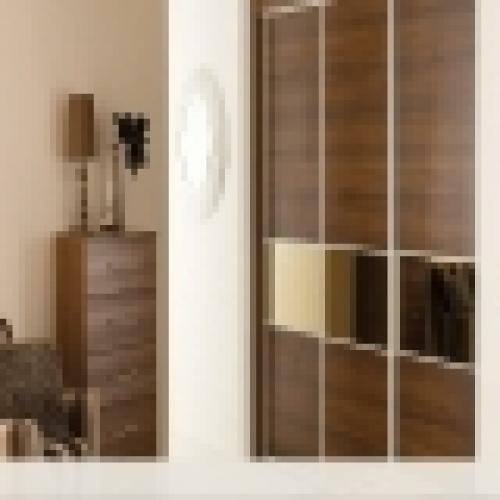 It is even possible to transform existing fitted wardrobes into new ones by fitting mirrored doors. As you can see, not only are mirrored doors a great way to open up a small room in your new home by reflecting the natural light coming in and giving the illusion of space, but they can also offer multiple aesthetic and practical benefits. This combination of benefits should be more than enough to convince you that mirrored doors are worth your consideration.